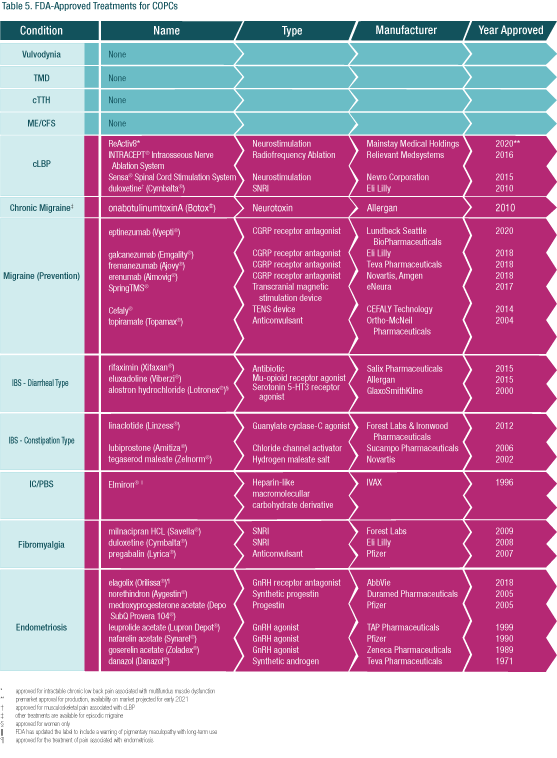 The following table summarizes the pharmaceuticals that have been approved by the U.S. Food and Drug Administration for the treatment of Chronic Overlapping Pain Conditions (COPCs). None of these treatments are indicated for more than one COPC, although several are used off-label to treat a number of the conditions. No approved treatments exist at this time for five of the disorders – vulvodynia, temporomandibular disorders, chronic tension-type headache, myalgic encephalomyelitis/chronic fatigue syndrome and chronic low back pain. Given the widespread prevalence and financial toll, significant rates of overlap, similar symptom presentation, common underlying disease mechanisms and appreciable unmet treatment demand, there is a tremendous opportunity for research and development of safe and effective treatments for COPCs.